Harvey Boyd James (69) of Wapato, WA unexpectively passed away from a heart attack on May 30, 2016 while marching his last march in Washington DC. Harvey was born on July 19, 1946 to Thompson and Marie (Craig) James. 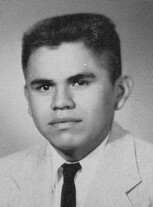 Harvey, a longtime resident of Wapato, graduated from Wapato High School in 1964. Harvey was a proud Vietnam Veteran, serving in the United States Marine Corps with 338 Platoon from March 1967 – March 1970, bravely earning the following medals: Purple Heart, Navy Achievement Medal with combat “V”, Presidential Unit Citation, Combat Action Ribbon, Meritorious Unit Commendation, Good Conduct Medal, National Defense Service Medal, Vietnam Service Medal with four bronze stars, Republic of Vietnam Meritorious Unit Citation (Civil Actions Color, 1st Class) Republic of Vietnam Campaign Medal, and Rifle Sharpshooter Badge. Later in life, after proudly serving his tours in the Marines, he met the love of his life, Melissa Jim, and they married on December 5, 1970 and were blessed with three children. Harvey retired from the BIA forestry division. Harvey was a father figure to those who needed one and his warm hugs will be greatly missed by all. He was truly a loving gentleman with a huge heart.